VICTORIA, BC – Phillips Brewing has announced the release of this year’s version of an annual ale that celebrates the best of BC’s local hops harvest. It’s harvest season, which means that the Green Reaper Fresh Hop IPA is once again reappearing to guide your taste buds to the aftertaste. The 2018 vintage is crafted with full-cone Centennial hops which are delivered fresh to the brewery and used within 24 hours of harvest. This special seasonal IPA is full of fresh floral and citrus flavours that finish with a delicious hop kick. 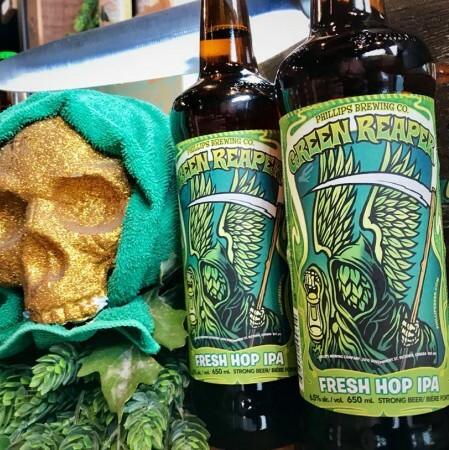 Green Reaper is available in 650 ml bottles at select private liquor retailers in BC and at the Phillips retail store while supplies last.